NOLA – It’s the city of life, music and magic.. oh and the booze. There is nothing “no” about this city. When you’re here, you’re always in possibility, always looking, always experiencing and enjoying. You just have to look in the right places. One place to look is Frenchman Street in the neighborhood of Marigny. Not only will you be able to look, but you’ll also be able to listen – to beautiful jazz that is. Walk up and down the streets filled with small and large jazz bars ready for those who want to listen and maybe dance. It is the so called “birthplace of jazz” after all. Oh and don’t forget to stop by The Spotted Cat. You’ll thank us later. If you want to head straight to the nitty gritty party scene of New Orleans, you’ll find it here. Blocks and blocks of bars offer drinks of all kinds from a sugary fishbowl (actually served in a fishbowl) to your plain vodka soda if you must. This place isn’t for the faint of heart. Get ready to smell some not so great smells but also get ready to enjoy a unique street thousands head to visit every year. If you want something a bit calmer, you can head over to Royal Street just blocks away from Bourbon Street. Miles and miles of shops line the street offering antiques, souvenirs, art and other trinkets. If you don’t feel like buying, just make sure you check out the galleries and maybe stop into one of the cafes. Of course you are! It’s New Orleans and if you haven’t tried their gumbo or jumbalaya, you haven’t tried the soul of the city. 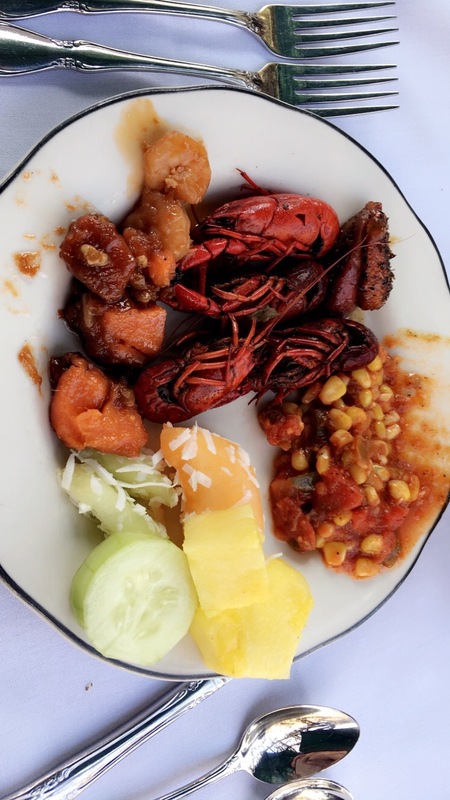 The melting pot of Creole/ Cajun cuisine gives the city its kick! You could say this is the nicest restaurant In town but it’s a name they earned. With a 50 page wine list and a menu that has everything from crawfish to filet mignon, you’re bad to find something your heart and taste buds will love. My recommendation? Try their snapper crudo to start then work your way to their gulf fish fish or the filet mignon. Do not miss the dessert! Their bread pudding soufflé is the best I have had and it’s not heavy! Three words – Bloody Mary Bar. They have it and it has all the garnishes you’d want for your tall glass of mary. Can you tell it’s a brunch spot? Their homemade dishes of french toast and duck confit are great sides with their live jazz. So you can jam out while you stuff your face on some of what NOLA has to offer and that’s a lot. Make sure to make a reservation. It gets packed. After brunch, you have the famous Magazine Street to stroll around in and maybe pick up some vintage or handmade items! If you’re on a budget, it’s also great for window shopping. Okay enough spices, let’s get to the seafood. It’s great and it definitely has a twist. Acme is known favorite in the city and one of their most popular dishes is their chargrilled oysters! There’s a line but it’s worth it! Not only is this a one stop shop because it’s a flea market, local vendors also take their treats there. Stroll through the market and pick up some trinkets before grabbing a couple of bites at various stands including oysters and crawfish at The Seafood Dock. Keep and eye out for their crab beignets!